Our second attempt at a dump was successful! 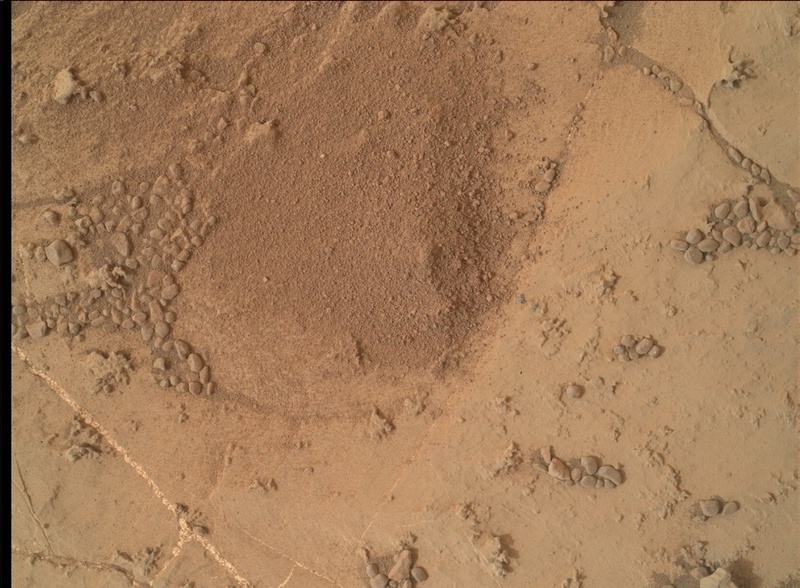 The plan for Sol 2155 starts with a whole slew of Mastcam images to check out various components of the arm turret, plus a MAHLI observation of the dump pile. After that, Navcam will look toward the crater rim to measure the amount of dust in the air, and ChemCam will analyze the targets "Ben Macdui" and "Tarskavaig," both of which appear to be interesting features where the bedrock chemistry and mineralogy may have been altered. Mastcam will take pictures of these two targets once ChemCam is done with them, and will also document the previous ChemCam targets "Laig Bay" and "Bealach na Ba." Mastcam will also take a high-resolution mosaic around the Stoer drill hole. In the late evening, MAHLI will take some pictures of the CheMin inlet funnel, and then we will place APXS over the tailings pile for an overnight analysis. If all goes well, this will be the last full day at the Stoer location, and tomorrow Curiosity will start driving toward the south!